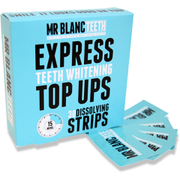 Achieve natural pearly whites with Mr Blanc's Teeth Whitening Strips, a two week supply of peroxide-free whitening strips that work to safely whiten and brighten your teeth. Clinically proven to safely and effectively whiten your smile, each flexible strip is coated with a whitening gel and fits perfectly to the contour of your teeth; a host of enamel friendly ingredients work on the surface and beneath, absorbing into the enamel to remove stains and prevent new ones from forming. Deeply embedded stains are reduced, and if used correctly, your teeth appear visibly whiter after just fourteen days. Expect a beaming, pure white smile with zero effort and zero fuss. In each packet you will find 14 sachets that each contain an upper strip (longer one) and a lower strip (shorter one). Wear MrBlanc teeth whitening strips in your mouth for 30 mins. Please Note: Do not eat or drink in this time as it may move or unstick the teeth strips.